Working Dog Training Schools are taught at three levels: The Fundamentals, Intermediate and Advanced. No matter how many decades of experience you may have had training dogs, everyone starts at the beginning – ‘The Fundamentals Working Dog Training School’. ‘The Fundamentals’ is an intensive module-based 2-day course with essential theory components, notes and plenty of practical sessions. Although written for adult-learning, our youngest student was nine and our oldest were in their eighties! All students receive a full set of course notes, which they are able to utilise when they go home to continue their training program. The course also touches on the basics of how to read stock, where to stand for smooth stock movement and low-stress stock handling. 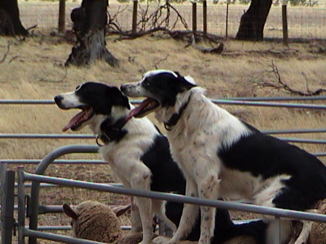 The Working Dog Training Schools, based on 'Ben Page's Natural Method', are unique. Only about 15 people are able to attend a course at any time, so please book quickly! ‘The Fundamentals’ is all about training you, the handler, so that you can learn the system to be able to train and work your dog, and your future dogs. Learn about the origins of the working dog, leadership rules of the dog pack, a complete system to bring out the dog's instinct and their working potential, and much more. No swearing, no shouting, just using the dog's language. Before enrolling you must have completed The Fundamentals. Before enrolling you must have completed Intermediate. Ben has formal professional training qualifications, as well as 40-50 years of stock handling and dog training experience. 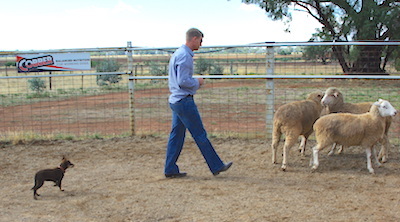 ‘The Fundamentals’ incorporates Ben’s experience and knowledge with cattle, sheep, military dog training, and breeding and training Kelpies and Border Collies for trialling and farm work. 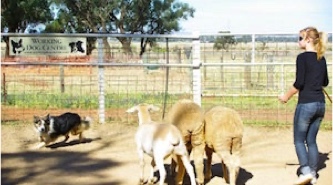 There is no other course in Australia taught by a professional that gives people a complete training system to train their dog to work livestock, with full notes, theory and practical components etc. That's why it's so popular. People come from all states and from overseas to attend, if they can get in. We've had students from Sweden, South Africa, Zimbabwe, New Zealand etc. Ben commenced with the livestock industry back in the 1960s when he was the first jackaroo (trainee manager) on the first commercial cattle property in New Guinea. At the time he was responsible for over 100 staff to completely build the property - yards, dwellings, houses, staff accommodation, cookhouse, etc - all by hand. All their stock work was done with horses, gently and quietly. About 30 or 40 years later someone invented 'low stress stock handling'... much the same thing!